Greetings! It’s Matt here with my first contribution to our mini-review series. While I’m not quite as plugged in to the underground buzz as Dave, I have accumulated a handful of intriguing albums from 2016 that slipped under his radar, so I’m going to take this opportunity to highlight some of them. Up first is Warm, a Connecticut four-piece progressive post-metal outfit that extend their sound from aggressive upbeat sludge to downtempo grunge-tinged grooves. The production on The Human Exemplar is solid, and the composition is unique; quality post-metal with prog leanings is pretty rare to come across. The drumming is a real treat, dynamic and creative, providing much more than just foundation rhythms. The guitars have great depth in their low end, as well as awesome lead contrasts. New Keepers of the Water Towers have been around for a few years, but what they were doing never quite resonated with me. I must have been listening with the wrong attitude, because when I gave them another shot this year, their psychedelic twist on sludgy stoner rock hit a sweet spot. Infernal Machine is not quite as captivating as 2013’s Cosmic Child, featuring a lot more stripped-down psych grooves than amped-up heaviness, but it’s still very much worth checking out. Philadelphia’s Cape Wrath, the creative outlet of singer-songwriter Jamie Glisson, is an intimate and powerful neofolk exploration. I must confess that my unfamiliarity with this genre renders me ill-qualified to make comparisons. Songs on Soul to Keep frequently cover a lot of territory within the same track, juxtaposing poppy vocal parts, heavy buildups, and stark breaks. The music is beautifully crafted but never overpowers Glisson’s vocals, which are the main highlight of this work. Be sure to stick around for the climaxes and denouements of ‘Death of the Sun’ and ‘Deus Vult’ to get the complete experience. I was a big fan of Russian psych-stoner group Камни‘s 2011 album A.T.O.M., so I was thrilled to discover their new album Чучхе a couple of months ago. You won’t find that many thick, fuzzed-out riffs here; they do get heavy at times, but their expertise is in atmospheric passages laden with swirling synth and trippy leads. They take things a few different directions on this album, shading toward rock on ‘Main Intention’, grunge on ‘No Need’, and a dash of punk on ‘Spirit’. If you’re going to capture my attention with a death metal album, it needs to be in that dissonant vein of bands like Gorguts, Portal and Mitochondrion. With Starspawn, Colorado’s Blood Incantation have thrown their hat into the ring, deserving mention right alongside those acts with their jazzy update of old-school death. Chaotic riffs gallop around without ever settling into one place for too long, while the bass takes its own path, and the drums shift fluidly between grinding blasts and subdued support. The 13-minute opener, ‘Vitrification of Blood (Part I)’, is one of the best tracks to ever come out of this style, and the whole album has the same merit. I’m not typically much of an EP guy, but I figure as a reviewer I should be willing to suspend that attitude to highlight deserving short-form work. So here’s 16 minutes of material from Chicago solo instrumental post-rock project Spark The Forest. Surface // Depths is two tracks, and I bet you can guess what they’re called. The first is a dark, reverb-soaked piece that utilizes piano, synth pads, a little lead ditty on guitar, and just a touch of percussive backbeat to give it structure. The build is nice, even if the track is quite simple. The second track, for which there is a very basic accompanying art video, spends a bit more time on heavy riffs. Three minutes in, the full thing kicks in, with a slightly distorted drum pattern underlying crunchy guitar and a lovely soaring lead melody. A break in the middle of the track allows some space for electronic elements, while the outro runs back that heavy part underneath a droning high note. The sound is nothing new – kind of generic, honestly – but the space and talent are there for improvement, so stay tuned for full-length There Is A Light Somewhere. If you’re a Wintersun fan who’s fed up with waiting for Time II, your hunger may be satiated by a pair of 2016 releases from France’s Onirism. This solo project blends progressive and atmospheric black metal with cinematic synth-orchestral soundscapes, aiming for epic grandiosity and not missing it by much. Even as someone who’s rarely turned off by music criticized as “cheesy”, I have to admit some of the synthetic parts here are a little cheesy, and don’t always blend seamlessly with the metal. But that critique notwithstanding, this is an admirable and praiseworthy effort for one man to produce! When everything clicks, like in the final salvo of ‘The Well of Stars Part IV’, it’s perfect. I enjoyed listening through both Cosmic Dream and the EP The Well of Stars, even if they didn’t stick in my memory long afterward. Lastly, one more solo project: Italy’s Summit, from the same guy behind The Clearing Path, offering here a tremendous take on prog-sludge with an emphasis on very unique melodies. It’s a very similar compositional approach to what you might expect in a band like Castevet, although really I’m scratching my head for comparisons because it’s so unfamiliar. Everything is done right: heavy parts, atmosphere, dissonance, harmony – there are very few bad decisions here. One drawback is that the drums are programmed, and at times this is not hidden particularly well, with unnatural blast beats jerking the listener’s attention away. I wasn’t totally sold on this album until I experienced the glorious second half of ‘Pale Moonlight Shadow’, which has one of the most beautiful guitar patterns in recent memory complemented with soaring synth pads. 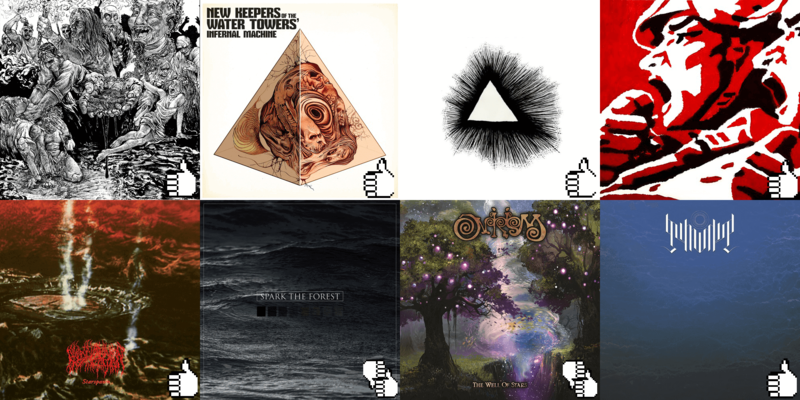 If you only listen to one track from this whole set of mini-reviews (like, if you just remembered you have a doctor’s appointment and have to run out the door in 10 minutes), make it that one. Let it be no secret that I’m both a huge Prince fan and a sucker for well-voiced female pop/R&B. Netherlands-based songstress Jarlentji Engel wins my heart, therefore, with this excellent adaptation of one of my favorite pieces of the Purple One’s lesser-known catalogue. It’s a brilliant cover because it’s well done and respectful to the original while also adding elements like that opening drumbeat and the very 2010s synth rhythm that allow Jarlentji to make this her own. She only has a couple of tracks up on soundcloud, but someone should give this girl a recording contract ASAP. On	August 26 2016, this entry was posted.